I was so pleased to have an dressage lesson this morning with my friend (and trainer) Anne. Anne is very modest about her dressage skills and ability to instruct effectively, but trust me when I say she is phenomenal. Plus, Anne and I are like…totally BFFs, which makes it even more fun when I can snag her for a lesson. It’s been months since my last lesson, and I knew that I needed one. Ideally, I’d love to ride with Anne every freaking day (which I did, just about, when our horses were boarded at the same place), but between our schedules, we just hadn’t been able to make a regular lesson time work. So Anne came out this morning and I hopped on Princess Pony and went to work. Now, I’ve been working very hard with Gina on our flatwork; I think Gina has improved immensely, and I feel like my riding is better. Riding a variety of horses has helped; becoming fitter has helped. But I was struggling with dreadful canter transitions and felt tense and stiff, but couldn’t really figure out how to correct myself. It’s so helpful to have someone on the ground: Anne was immediately able to spot the problem. My right shoulder rolls forward, which puts me off balance. I have a difficult time tucking my seat underneath me in my jumping saddle, which makes it harder to apply my leg aids effectively. 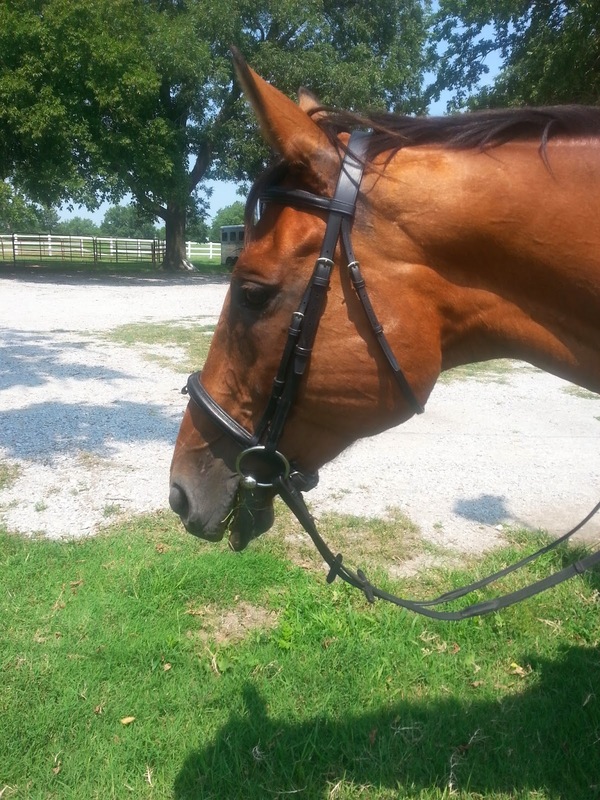 And at the canter, I become very tense, stiffen my hands and wrists, and don’t give Gina an opportunity to relax. Anne’s solution to the seat problem was sitting trot, which on Gina is close to torturous. Gina’s trot is big, floaty, and bouncy. I felt like I was slithering all over the saddle, killing my horse’s back, and looking truly hideous. Anne insisted it was an improvement. Canter departures from the sitting trot were much better than from posting. Gina really stepped up into the canter and didn’t fly around off balance with her head in the air. Success! My most important takeaway from today’s lesson was this: don’t push too hard. Everything doesn’t have to be perfect, all the time, immediately. If Gina and I do half a 20-meter circle of quality canter, take it. Don’t let it fall apart, and canter around and around until perfection is regained. Take the half circle of good work, and try to make a whole circle next time. I sometimes get so hung up on having everything just so that Gina and I end up tense, frustrated, and unproductive. It felt good to have a pleasant, productive lesson- but more importantly, I was ecstatic to spend time with my friend!